Pressure cookers are gaining momentum as the new healthy, time-saving, and energy-saving way to prepare food. While not a new method, the technology has certainly been transformed over the years to be easier and safer than ever. Constructed from 18/10 stainless steel for long-lasting durability, this 8-quart pressure cooker makes it possible to save up to 70 percent of the time and energy traditionally used in cooking rice, meat, and vegetables. The cooker's lid offers a long handle made of black heat-resistant plastic for comfortable use. A safety-lock handle, visual pressure indicator, and an automatic pressure-release setting ensure the lid won't come off unintentionally. For added convenience, the cooker provides a handy basket insert, complete with legs and a loop handle--great for draining pasta or steaming vegetables. Dishwasher-safe parts make cleanup a snap, and an instruction manual and recipe book come included. 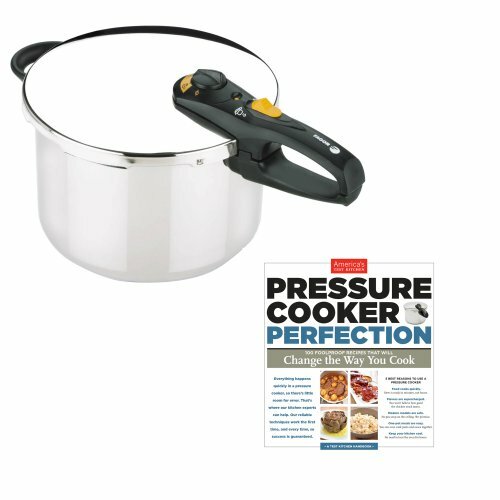 Designed for use on all heat sources, the pressure cooker measures approximately 17-1/5 by 11 by 10 inches and carries a 10-year warranty. America's Test Kitchen 'Pressure Cooker Perfection' cookbook includes 100 foolproof recipes that will change the way you cook. Everything happens quickly in a pressure cooker, so there is little room for errors. That's when our kitchen experts can help. Our reliable techniques work the first time, and every time, so success is guaranteed. 5 best reasons to use a pressure cooker: Food cooks quickly: stew is ready in minutes, not hours. Flavors are super charged: you won't believe how good the chicken stock tastes. Modern models are safe: No pea soup on the ceiling. We promise. One- pot meals are easy: You can even cook pasta and sauce together. Keep your kitchen cool: no need to heat the oven for hours.